Player-coach Matt Goode was full of praise after seeing Banbury Bulls enjoy a try bonanza at Swindon. Goode felt it was one his side’s best ever displays, not only in terms of the 13 tries they scored but also that they denied Swindon a single point. 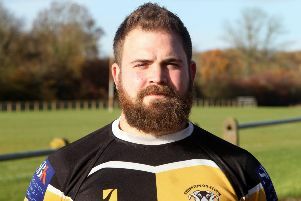 Bulls still trail second-placed Old Centralians in Wadworth 6X South West One East by four points after they comfortably beat Witney as expected. Bulls were forced into positional changes with usual pairing of Ed Phillips and Sam Stoop unavailabl, so Justin Parker started at nine and Tommy Gray took over at ten for the first time this season. Gray looked totally at ease playing ten, pulling defenders left and right, creating the gaps for others to run through, and controlled the game for 80 minutes. Goode added: “We moved the ball really well, I thought Tommy Gray at ten was outstanding, the communication from the boys around him helped too. We know we can score tries, we know we can usually get those bonus points.